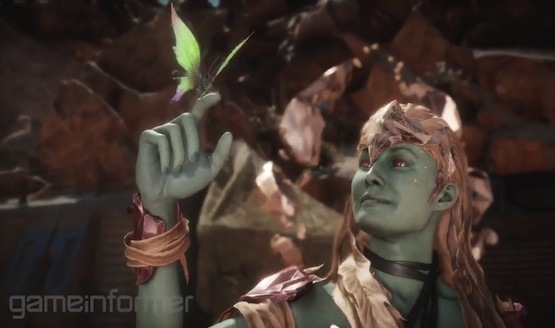 Fights are going to get rocky as Mortal Kombat 11’s Cetrion joins the kast of kharacters. She is an elder goddess who uses rocks to crumble the competition, among other elemental attacks. The trailer they show displays a wide variety of moves based on her premise as an elemental elder god. She can use vines to entangle, some sort of wind attack to mess the opponent up, summon rocks to block projectiles, unleash fire from the ground, and bash her enemy’s skull on a big stone. Not much more information has been given about her other than the brief gameplay shown. Game Informer promises a deeper dive into the character later this month. Recent characters who have been announced include Noob Saibot with clone abilities, Jacqui Briggs returning from Mortal Kombat X, who uses gadgets to help get her victory, and Shang Tsung, who will be the first DLC character for the game and hosts the Krypt mode. Fun fact: Shang Tsung is actually being played by the 90s Mortal Kombat movie’s original actor Cary-Hiroyuki Tagawa! Are you ready to play to test your might online in Mortal Kombat 11? Which characters are missing from the roster for you? Let us know!